As part of mentoring out High School’s First Robotics Team Andromeda One I have learned Solidworks. Since we have a Jet Mill converted to CNC (running GRBL and a Chinese controller) and several of the other mentors, including myself, having CNC routers like the ShapeOKO 2 and X-carve we wanted to be able to have a one-stop shop for doing our design and CAM toolpath generation. There are some generic postprocessors for Solidworks but none seemed to support exactly the post processing options and syntax I wanted to see. 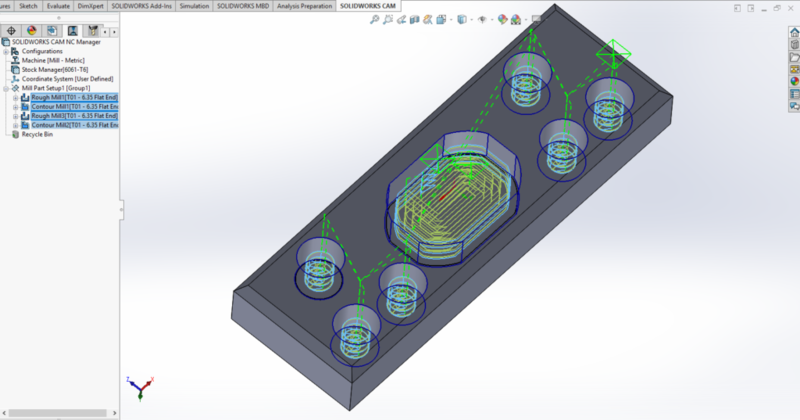 As such I embarked on writing my own post for Solidworks. When installing it is necessary to install it as Administrator. If you do not it will not install properly/fully and may not work properly. I then used this tool to edit a Postprocessor from scratch and compile it into something Solidworks understand. Note, this was not very straight forward and resulted in several iterations of trial and error until I got it close enough. I’m still getting syntax errors on comment lines. For some reason the line starts with an “*” then the line number and then the tool comment. I cannot determine where this “*” is coming from in the post or how to get rid of it. The second issue is the line numbers, These are very much a personal preference but even if they are disabled in the post configuration they still appear on the output in Solidworks. In the end the postprocessor output needs to be post processed to run on my CNC with a text editor to fix the tool comment lines.